Communication is the core of any negotiation. Good negotiators must be able to clearly explain their positions, and then listen, ask questions, answer questions, make use of these answers, and discuss alternatives solutions. In order to find common ground and establish a resolution that all parties are satisfied with, everyone must be on the same page. On a piece of paper you draw a circle, a triangle, and a rhombus. A test taker sitting across from you must try to draw the same figures and their positions on the sheet exclusively on the basis of your oral explanation. He isn’t allowed to ask any questions. This is an example of one-way communication, and, as you may have experienced in this experiment, it can be very difficult to get information across in this way. While your own words seem perfectly clear to you, to someone else, their exact meaning can be quite difficult to grasp. If you are speaking to someone for the first time, especially if they are from a foreign country, take the extra time to make sure every detail of what you say is being absorbed. Now repeat the experiment, but this time allow the test taker to ask questions, which you can answer. Within a very short time it will be possible to produce good reproductions of the image you’ve tried to communicate to your test takers. This is two-way communication, and it is the hallmark of functional communication. The ability to achieve a mutual understanding in a negotiation will create trust and a rapport between the parties. If possible, try get your point across visually as well as orally, using a drawing or a diagram. The more channels of communication that are utilized, the stronger the understanding will be. Good communication is based on openness and trust, and vice versa. It fosters a negotiation that allows for a type of cooperation in which you can find solutions that satisfy both parties. Instead of using energy to fight and argue with each other, you use it to produce a bigger pie to share by means of alternative solutions. You create added value through the way you negotiate. 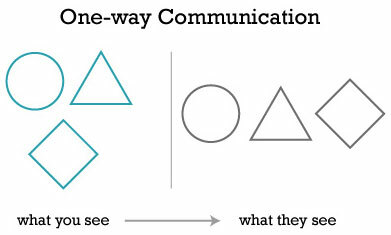 Mastering communication is not easy, but with practice you can articulate even the most complex ideas. ← SMARTnership™: Don’t Come Out Swinging!